These days, for a whole host of reasons, destination weddings in Italy are more popular than ever. If you’re looking for a special setting in which to say “I do”, with your closest friends and family around you, then a wedding in a vineyard in Italy is hard to beat. In a country like Italy, the scope for romance is limitless. If you choose to hold your wedding in a vineyard, your options for shaping the event to your own taste are virtually endless for a unforgettable most perfect day. 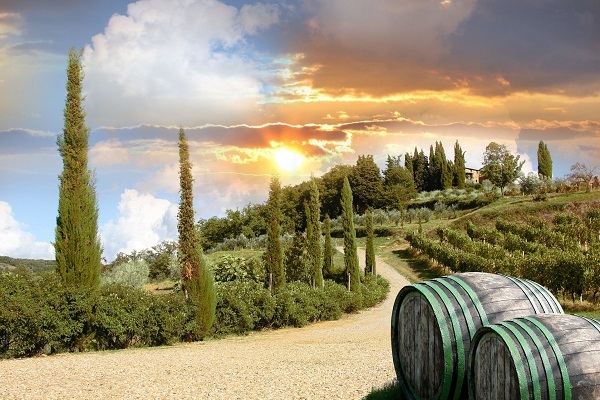 With One of the reasons a wedding in a vineyard in Tuscany is so popular is that the weather is more reliable there than elsewhere in Europe. Although high summer is the obvious time for a vineyard wedding in Tuscany, there is a lot to be said for holding it in spring. The weather is likely to be perfectly pleasant for a vineyard wedding in Tuscany without the oppressive heat of the summer months. Spring is also the time when wildflowers are in abundance and the trees are in blossom. Little details like this can make all the difference when planning your wedding in a winery in Tuscany! In many respects, Tuscany is a region of contrasts, from its cities of art such as Pisa and Florence to its rolling countryside. A farmhouse wedding in Tuscany or a wedding in a winery in Tuscany takes in the best of both worlds. Italy produces some of the finest food and drink in the world, and what better opportunity to sample it than a vineyard wedding in Tuscany? A farmhouse wedding in Tuscany or a vineyard wedding in Tuscany both make these ideas possible. In Tuscany couples can choose to have their wedding in the birthsplace of the famous Tuscan wines. Wineries around the Chianti area, Siena, Montalcino and Bolgheri will be the perfect host for a romantic and unique vineyard wedding in Tuscany. Most people would agree that the opportunity to hold your wedding in a winery in Tuscany, in one of the most beautiful regions in the world, is nothing short of a privilege. You can take advantage of the weather, you can enjoy some fabulous food and wine, and all in the setting of a romantic vineyard. What could possibly be more perfect than a wedding in a vineyard in Tuscany? You are looking for the best wedding venue in Tuscany for a unique vineyard wedding? Don’t look any further. Our portolio features the most stunning vineyard wedding venues throughout the Italian region of Tuscany.